Recognized as a “whole of government” doctrinal reference standard by military, national security and government professionals around the world, SMARTbooks comprise a comprehensive professional library designed with all levels of Soldiers, Sailors, Airmen, Marines and Civilians in mind. SMARTbooks can be used as quick reference guides during operations, as study guides at education and professional development courses, and as lesson plans and checklists in support of training. Our reference series of books are carried at virtually every Army and Air Force base around the world and have spanned the globe with more than 550,000 copies sold. Step-by-step approach. Step-by-step instructions & illustrations make complex procedures as easy as 1-2-3. Comprehensive quick reference & documentation. Compiled from the latest official military and government publications; look up what you need and get straight to work. Straightforward. Thousands of pages are condensed to provide concise information in a single SMARTbook. Portability means accessibility. Taking the place of multiple field manuals, publications and training circulars, SMARTbooks fit easily into a leader’s bag, back of a rucksack, or the cargo pocket of a uniform. SMARTnews Email List. Join our SMARTnews mailing list to receive free e-mail notification of new titles, updates, revisions, doctrinal changes, and member-only discounts to our SMARTbooks. Click to join the mailing list! The SMARTbook reference series is used by military, national security, and government professionals around the world at the organizational/institutional level; operational units and agencies across the full range of operations and activities; military/government education and professional development courses; combatant command and joint force headquarters; and allied, coalition and multinational partner support and training. All references used to compile the SMARTbooks are in the public domain and are available to the general public through official public websites and designated as approved for public release with unlimited distribution. The SMARTbooks do not contain ITAR-controlled technical data, classified, or other sensitive material restricted from public release. 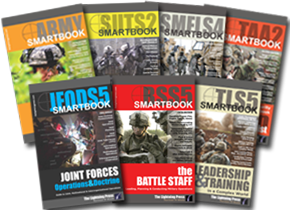 SMARTbooks are reference books that address general military principles, fundamentals and concepts rather than technical data or equipment operating procedures.